The Bennington Center for the Arts will open Art and the Animal XVII June 16th and the show will continue through August 5th. 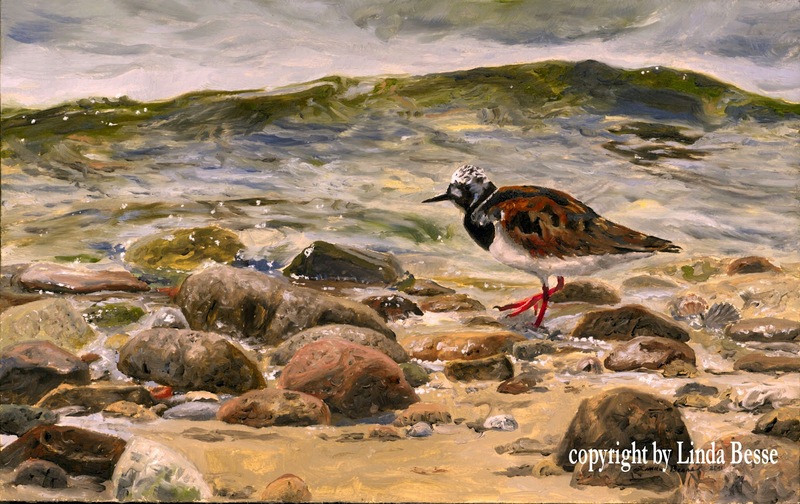 My oil painting Ruddy Turnstone was accepted for the juried show. If you get a chance to hit either this show or another one at The Bennington Center for the Arts, you won't be disappointed. This is a wonderful art center! You can find information on all their events at www.thebennington.org . Note: If you are interested in covered bridges, The Bennington Center for the Arts is THE place to go. They have a beautiful and informative exhibit on this classic New England structure. Turnbull National Wildlife Refuge is about an hour from my home. The approximately 16,000-acre refuge of Channeled Scablands contains 130 marshes, wetlands, and lakes for a combined total of 3036 acres of wetlands. I think every time I make the trip there, I see a moose. This time within minutes of driving the circle road I spotted a calf from last year close to the road. She was munching down the fresh wildflowers which had cropped up from our April rains. 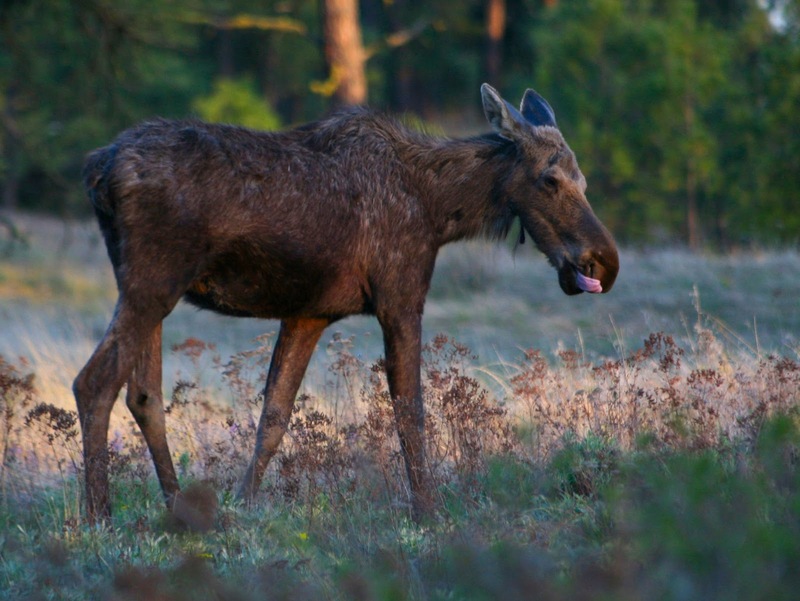 My presence did not disturb her as she continued eating with moose-y abandon. Before I left that evening I also saw a large cow moose in another area of the refuge. In addition, the late afternoon trip netted sightings of numerous pairs of duck species, a killdeer, 2 white pelicans, 2 muskrat, a pair of trumpeter swans, and 4 deer. A trip full of inspiration for future paintings. 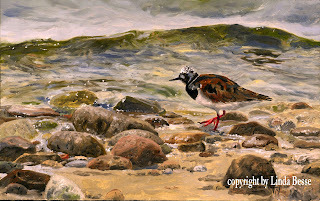 There are a number of things I have done since my last blog to complete the painting. First I added all the "whites" and highlights on the flamingos. My white was titanium white with a little cadmium yellow deep. For more pinkish whites I used titanium white, cad. yellow deep and permanent rose or cadmium red deep. The water needed a little more reflection and some "white" reflected spots. The final touch was a more difficult decision. The piece was looking a little on the cool side and needed a warm "vibrating" touch. Also the horizon line was too white and mushy (I know I shouldn't use these technical artist terms but sometimes they just fit.) I painted a lemony yellow line but kept it on the warm side. The color wasn't doing what I wanted it to do. I still needed to be in the yellow tones but I warmed it up and made it more peach. Once I did that, the scene felt more alive and more festive. Like a party was going on. The last thing I do is name the painting. I had a working title. When I sent an image of the painting to the new owners, I told them the tentative title. Fortunately, they had a much better title. Abundance was now complete. Water is one element which I really enjoy painting. In this painting, believable rendering of the water is critical to the piece's success. In this top photo, I am working the details of the water in the middle ground. There are myriad reflections and it is easy to get lost among all the legs!!! Next is the large expanse at the bottom. I know from experience this is a "one sitting" deal. I can't paint part of it today and finish tomorrow. I use Rembrandt oil paints and brown mixes can dry overnight while my "whites" can take a week. Blues and reds will be somewhere in the middle. For the water to work, all of it has to be wet and blended. I completed the below stage at 1 am. Stay tuned for the final stage. It might look as if the birds are all done, but I am saving their highlights until after I paint the water. One of the things which sticks with me from my trip to Lake Nakuru, Kenya (other than the sheer beauty of hundreds of thousands of flamingos) was the noise. These are chatty birds. When you get this close it is like going to a rock concert! At one point I was surrounded on three sides by the birds......and it was wonderful. One is said he "can't see the forest for the trees" when he is focused on the detail rather than the big picture. Here, I have been painting a lot of "trees." It is hard to see how it will be a cohesive painting, a "forest," when the multitude flamingos need to be painted almost one by one. Once I finish this mid-ground I can begin on the really fun birds in the foreground whose bright colors will carry the painting. It is tempting to rush through this section but I know the painting would suffer if I did. To grab another timeless saying, "Slow and steady wins the race." The background flamingos in the air have a impressionistic touch. As I move down to the foreground, the birds will gain detail and sharpness.